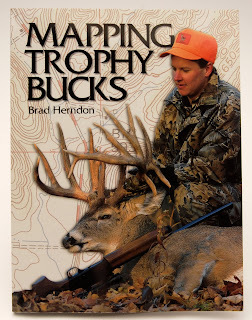 I picked up Mapping Trophy Bucks by Brad Herndon on the recommendation of several guys who frequently post on the serious deer hunting forum at TnDeer. They recommended it in response to my review of the eTrex H GPS and the TOPO! state series of topographic mapping software which I posted here. If, like the author who lives in southern Indiana, you are lucky enough to gun hunt for rutting whitetails in the farm belt of the Midwest where there is lots of cropland, lots of deer, and limited blocks of cover, then this is a good deer hunting tutorial. If you hunt (particularly with a bow) in other areas of the country where deer are much less likely to be concentrated into small blocks of cover, I think it offers some sound advice on recognizing and using terrain features, but I think it falls short in one very critical area which I’ll discuss below. This book is written at a very accessible level and contains useful information that will appeal to both novices and hunting veterans alike. The author liberally sprinkles in examples and anecdotes from his long hunting career which gives the book the feel of a campfire conversation more than a classroom lecture. It is chock-full of high-quality photographs taken by the author and his wife. There are separate chapters with detailed descriptions, illustrations, and examples of funnels, saddles, benches, corners, points, converging hubs, breaklines, and fencerows. The reader will come away with a good understanding of what each terrain feature is, how it affects deer movement, and how to recognize it on a topographical map. The book also contains good advice on related topics like choosing stand locations based on wind direction, keeping detailed records, dressing appropriately, and hunting during mid-day. I have to say up-front that bowhunting is my passion, so my impressions of this book are heavily influenced by my goal of getting within 30 yards of a relaxed deer in order to maximize my chances of making a clean, ethical shot. In a nutshell, if a hunter were to follow the author’s advice, he would study a topo map of his hunting area, identify the key terrain features listed above, determine the optimum wind direction for each potential location, and then hunt whichever one(s) matched up well with the wind conditions on any given day. All of that is good, but it neglects the most important aspect of consistently getting within bow range of a deer and that is that you’ve gotta hunt where the deer are! The only way to know where the deer are is by reading the sign. The author’s discussion of sign is limited to a few brief sentences on scrapes and rubs which he (correctly in my opinion) advocates paying limited attention to. There is no mention however of using tracks, feeding sign, or most importantly, droppings to determine whether deer are using a particular terrain feature at that specific time of the season. Yes, deer will typically travel through saddles or follow funnels, but only if there is a reason for them to do so at that specific time. A deer’s activities are dominated by three things, food, cover, and reproduction. Without knowing how those factors are influencing the herd’s behavior at that instant and reading the sign to know how they are reacting, you are simply depending on luck to see and kill a deer. Will you occasionally get lucky? Sure, but those aren’t the kind of odds that will get me out of bed at 4:00, morning after morning. Update: check out the sign in the video in my next post. Now that will get me up long before the alarm ever goes off! Another gripe I have is the lack of information on how to use a map and compass to get around in the woods. The author discusses using a compass to determine wind direction but doesn’t mention using it to actually navigate. It’s one thing to say I’m going to hunt that saddle. Actually getting there can be another. My final gripe has to do with one of the things I pointed out above as a positive, the photos. As a photographer for Realtree, the author has drawn heavily on his library of photographs taken for advertising and promotional purposes. Virtually all the photos are posed (sometimes in goofy situations) with the models wearing perfectly matching camo that has obviously never seen the first washing. Not terrible, but enough to get slightly annoying. Oh yeah, then there was the photo of a guy with his map and compass laid out on a steel treestand – not something I’d recommend if you want to get where you’re going. Overall, this is a worthwhile book for the description of terrain features and how to recognize them on a topo map. It is an easy and pleasurable read that I enjoyed next to a roaring fire on a cold, rainy, March day. Just recognize that it is only a useful tool and don’t look for it to be the definitive guide to regularly killing mature whitetail deer – despite the title.